Annual crowning of the Rose Queen! 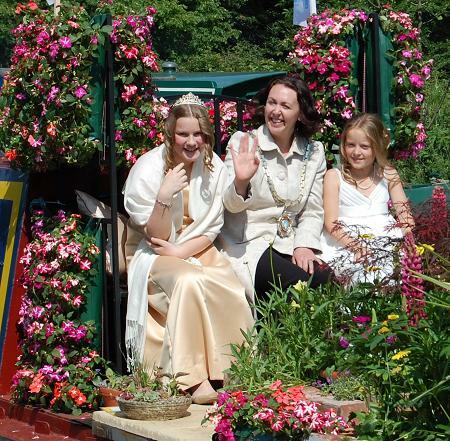 Pott Shrigley held its annual Rose Queen Weekend Festival on Saturday 23rd June 2012. Keith & Margaret Mottershead openned proceedings and there was Maypole dancing and singing by the school, Poynton School Brass Band, pre-school Jubilee themed fancy dress, a beer tent and BBQ, Tug-o-War contests, and a variety of side stalls. Pott Shrigley Church School pupil, Lily Kennedy, was crowned as the new Rose Queen, and Elanor Malyan was in attendance as the new Rose Bud. Of special importance this year was the Dedication of the new Village Green to Her Majesty the Queen. On Sunday 24th June, after the Rose Queen Service at St Christopher’s Church, everyone was invited to a Family Picnic on the Village Green!